In the Sunday Business Post. 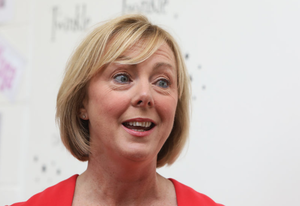 Hugh O’Connell reported on the €16,000 allowance that the Minister for Social Protection Regina Doherty was paid when she was government whip but subsequently told to pay back to the State. She was paid it as she was one of the three so-called super junior ministers at Cabinet. But, as readers will recall, legislation only allows for two politicians to receive the sum. She told The Irish Times last Monday that she was told to pay it back following a report by the Attorney General. 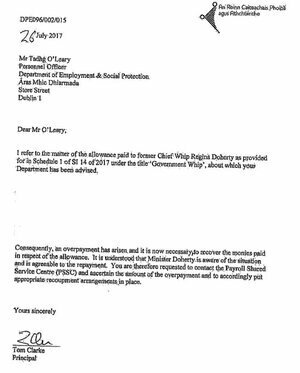 It was only confirmed last Monday that Doherty, who is now the Minister for Employment and Social Protection, would be repaying the allowance despite her department being informed this would need to happen at the end of July following a review by the Attorney General. 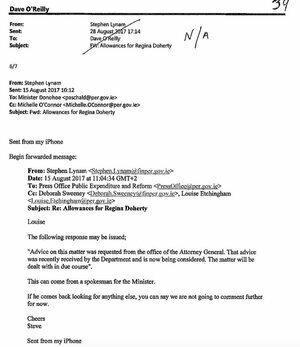 Documents obtained under Freedom of Information show that a letter from the Department of Public Expenditure (DPER) was issued to Regina Doherty’s new department on 26 July last asking officials to make arrangements for the money to be repaid. 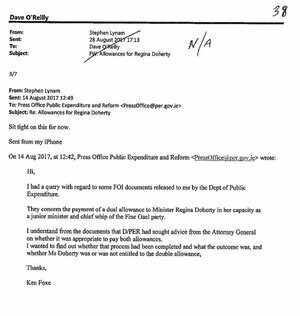 …The documents reveal a number of journalists made inquiries to the Department of Public Expenditure’s press office about the allowances situation with officials seeking out Stephen Lynam, Minister for Public Expenditure Paschal Donohoe’s special adviser, for advice on how to proceed. 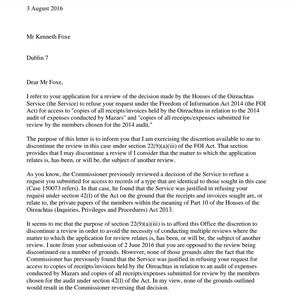 On August 14, Lynam told the DPER press office to “sit tight on this for now” after being alerted to a journalist’s inquiring if the AG’s review of salary arrangements had concluded and what the outcome was. 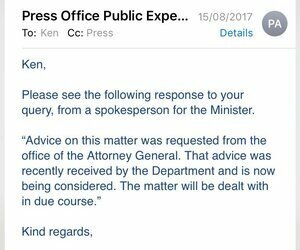 Been in journalism a long time but kind of staggered to have a government department bare face lie to you about Regina Doherty allowance. 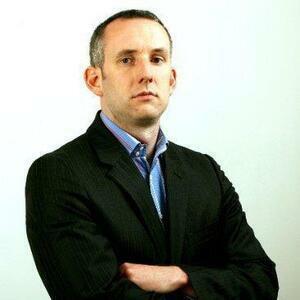 Posted in Misc and tagged Hugh O'Connell, Ken Foxe, Regina Doherty, sit tight at 11:51 am on October 2, 2017 by Broadsheet. How did Regina ever become a minister in the first place. She seems to be a walking disaster, an Ivor Callely in waiting. is she effectively stealing money here? It has now become news because they decided to hold back the confirmation of it for 2 months, and to what end? 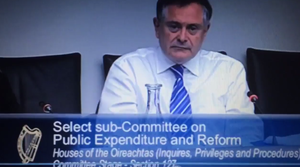 Tax avoiding social protection stooge, what a laugh..